You really believe you are something, don't you? I've reviewed several stories today about your "questioning" the President, and I've watched the film. Helen, you were schooled and used by the President. Good for Him! Helen you remind me of the old crone in the village that people allow to speak even though everyone knows what she is going to say. Now shut up. You are arrogant, you are rude, and you are an exceedly ugly human being. Just shut up. 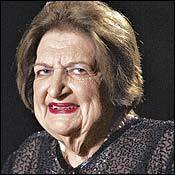 I have long thought that they allow Helen Thomas to remain in the room during press conferences because they were raised to respect their elders and don't know how to ask her to leave politely. Now I realize that apparently she does have some use after all. Bill and Hillary Clinton's Latest Scandal?